This certificate program is a multidisciplinary educational experience designed to enhance the knowledge and skills of individuals who provide care and support for childbearing women, newborns, and families. The demand for knowledgeable providers to meet the needs of this population is dramatically increasing; new jobs are being developed and new services created. 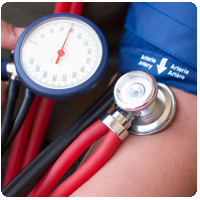 If you are a health professional who works with this population (or would like to do so), this program will help you stay current with emerging trends in this specialized area of health care. Certificate in Perinatal Issues requirements: For taking this instructor led ExpertRating Online Perinatal Care Course you need Internet access, e-mail, and the Microsoft Internet Explorer or Mozilla Firefox Web browser. Certificate program must be completed within six weeks of the start date. ExpertRating is one of the world's only ISO 9001:2015 Certified companies (from TUV America) offering an Online Perinatal Care Course (leading to ExpertRating Perinatal Care Skills Certification). When you choose the ExpertRating Online Perinatal Care Course you can be sure that you are buying a premium International certification that is recognized by hundreds of employers and Government bodies in the US and other countries. With ExpertRating you get certified quickly online and you are equipped with a store house of information through the in-depth ExpertRating Online Perinatal Care Courseware which has been developed by experienced healthcare experts. The ExpertRating Perinatal Issues Skills Certification is by far the best value for money instructor led Perinatal Issues Skills Program at $149.99 . How much does the Perinatal Issues Skills Certification cost and what does it include? You can buy this ExpertRating Online Perinatal Care Course leading to Perinatal Issues Skills Certification at a special offer price of only $149.99 which includes the in-depth ExpertRating Online Perinatal Care Courseware and exam fee. This is the best value for money Perinatal Issues Skills Program available till date. You get the following services within the USD $149.99 fee. In-depth ExpertRating Online Perinatal Care Courseware including scenarios and case studies. 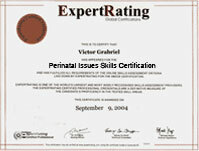 World wide airmail delivery of the hard copy Perinatal Issues Skills Certificate. The Perinatal Issues Skills Certificate can be used to prove your certified status and does not mention the words "online". The process of getting yourself certified is very simple. All you have to do is buy the ExpertRating Online Perinatal Care Course for $149.99 . Log in to the instructor led course using your password. Go through the ExpertRating Online Perinatal Care Courseware (which would take you 6 weeks) and complete the final Perinatal Issues Skills Certification exam at your convenience. You can complete the exam within 2 months of buying the Perinatal Issues Skills Certification. The result of the exam appears as soon as it is completed, and your Perinatal Issues Skills Certificate is mailed immediately. Chapter assignments to help you practic0piy use the Perinatal Issues Skills that you will learn during the course. The final exam is fully based upon the ExpertRating Online Perinatal Care Courseware that is provided along with the Perinatal Issues Skills Certification. If you have gone through the courseware properly you should not have a problem clearing the exam. The exam consists of multiple choice questions from 0pi chapters of the ExpertRating Online Perinatal Care Courseware. This is a comprehensive guide which will include important topics ranging from the postnatal period to the impact of childbirth on the adult personality. Perinatal defines the period occurring around the time of birth (5 months before and 1 month after). This course promotes maternal, fetal and neonatal welfare. 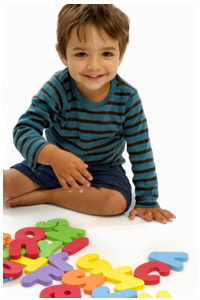 It also encourages infant development and maximizes the potential for each patient. You will learn about labor and delivery, pregnancy, infants and infant care. If you are one of the many parents who are faced with the dilemma of caring for their new born baby and themselves, then this is the right course for you. This course is a great information source for to-be parents, nurses and nursing assistants in providing proper perinatal care. The ExpertRating Certificate in Perinatal Issues course is a useful guide which contains relevant information about perinatal issues. ExpertRating Solutions has been reviewed by TRUSTe for compliance of their strict program requirements ensuring that your information is always safe.